Join in a series of 9 monthly meetups both in Barcelona and Madrid. Each meetup will focus on a particular facet of FinTech and will feature local and international experts. They will follow a format featuring keynotes, panel discussions and a startup competiton! 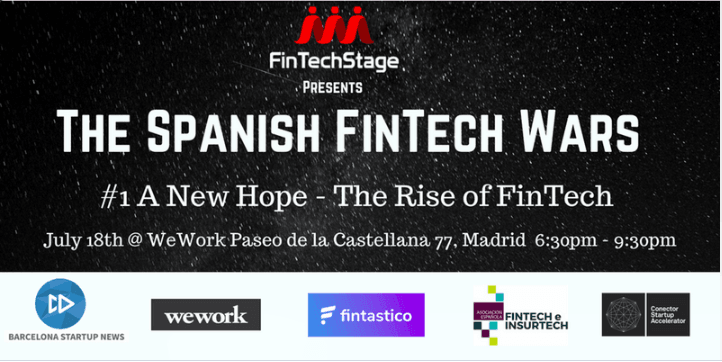 With this initiative they aim to showcase the Spanish FinTech ecosystem and the potential it has to become a thriving FinTech Hub. It is important that the meetups become a place of encounters and learnings between Fintech players. That is why all of the series are FREE to attend. What matters, is that this is a time every month we come together to share, partner and have some beers while talking about FinTech! On July 18th, will talk about the rise of FinTech and how it changed the financial landscape. Come listen the speakers and selected startups before enjoying some draught beers (or wine) and food on the terrace. STARTUPS – Interested in pitching and compete for a 500€ cash prize? Send us an email at paula@asociacionfintech.es with a brief desciption of your product/company and your logo!